Monday December 7- 1931 I did not get up till noon Hattie went to a lecture in the afternoon with Mrs Ensign and up to Virginia Sweeneys in the evening to play cards Tuesday December 8- 1931 I was rather wretched most of the day William & Mary came they brought me a letter from Laura Hattie & Cora down town in PM Hattie did some errands for me and was at Mrs Gays awhile. a letter from LeGrand Wrote Will Work. Evening down stairs paid Mrs Gay 30.00 Wednesday December 9- 1931 It snowed last night. The trees are covered with it. Poor Little Buster died this morning Hattie away awhile in PM. Spent evening down stairs Thursday December 10- 1931 A dark foggy day. Hattie & Cora to Esther Swishers to a red party I wrote LeGrand Laura Winnie and Emma Herriott Hattie to a play in the evening with The Ensigns It is 13 today since Will died Aunt Emma is 88 years old today. 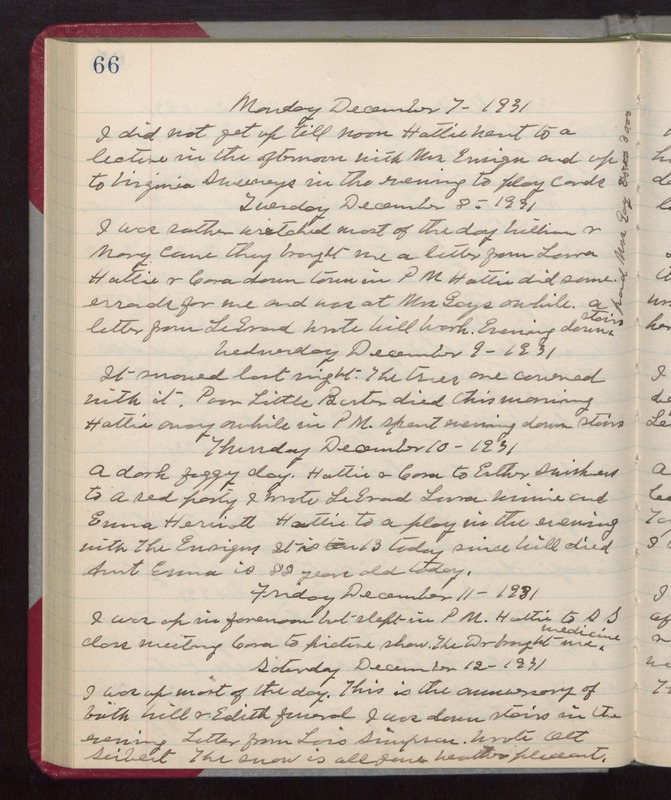 Friday December 11- 1931 I was up in forenoon but slept in PM. Hattie to SS class meeting Cora to picture show. The Dr brought me medicine Saturday December 12- 1931 I was up most of the day. This is the anniversary of both Will & Edith funeral I was down stairs in the evening Letter from Lois Simpson. Wrote Ott Seibert The snow is all gone Weather pleasant.